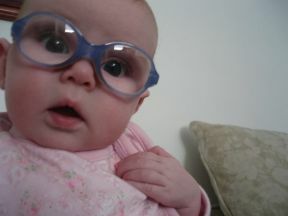 Penny, 3 months – she wears glasses for bilateral congenital cataracts. She is wearing blue Disney Pooh frames. I’ve had to add pieces of fabric bandaid on the nose to help give some friction and keep them from sliding down her nose.